Your little one is growing up fast. Don't miss these must-do moments. Hey, New Mom, we know how you're feeling: exhausted, having lofty dreams of a shower that lasts more than two minutes, actually sleeping more than a handful of hours at a time and getting those breasts that used to belong to you back. While you might look forward to a time when Baby isn't quite as dependent on you as he is now, try to keep this in mind (when you have the brainpower to remember): these first 12 months are fast and precious. 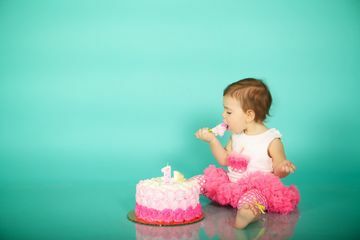 We don't need to tell you how quickly baby is growing—you're taking those month-by-month pictures, already—but before you buy that smash cake for baby's first birthday party, use this checklist to savor all of those sweet moments. Once baby realizes she can use those feet she's so amazed by to walk—and eventually, run—there will be no stopping her. So, while she wants to and since you're tired anyway, soak up all of those snugly moments. Smell the top of her head. Close your eyes and let yourself feel just how sweet it is to spend time with this little wonder you created. Your growing babe isn't going to fit in those adorable newborn onesies after a few months. Sigh. The good news? There are many places—like this shop on Etsy—that'll make those keepsakes into a quilt you can keep forever. Stop taking photos—record more video! Though you might watch your home videos from your childhood on the VCR (or maybe even a projector), your baby has the advantage of being born in a mostly digital age. Take videos of things you'll definitely want to embarrass your kid with in the future—bath time, funny sounds and faces, and of course, those too-cute-not-to-Instagram moments, too. Regardless of whether it's your backyard or a trip to get Baby's first passport, start introducing your little adventurer to the many wonders they'll get to explore as they grow older, and give yourself some time out of the house, too. Baby might not be able to talk back, but why not tell him why you love watching the sun rise or how the butterfly got its wings... or why Mommy needs another Starbucks, stat? There's nothing quite as attractive as your husband when he gets up at 4 a.m. to change another diaper while you sleep. Or when you see your babe swaddled on your man's chest. The first year of being new parents can be tough on your relationship, and it's an important time to really establish your family bond. Take care to start creating traditions, like having Chinese food (with a side of breast milk) on the couch every Friday night. You're now a party of three instead of two, so why not celebrate it? Could you imagine handing your daughter a letter to open on the day you drop her off at college that you wrote when she was just six months old? About all the dreams and hopes you have for her, how you hope she'll always chase her goals and believe in herself? Now is the time to write something special like that—even if you're not quite the writer. It can be a few lines or a few pages, whatever you feel, whatever you'd like baby to know in the next 18 years to come. ...and maybe teach yourself, too. You might not want to hand over your (fragile! Crying! Pooping!) newborn to your own mother, mother-in-law or husband, but you can't be connected to your baby forever. And the more you teach him now to be comfortable with the people you love, the braver he will be. Take time to find a babysitter you really trust. Let your parents watch baby for a few hours so you can have a (much-needed) date night with your guy. Even if it's just a few hours, be brave, Mama. You've got this. If you really think about how messy, exhausting, traumatizing and life-altering babies really are... you kind of laugh, right? You might not be to the stage where the whole newborn thing is funny yet, but you'll get there. And in a few months, when baby really starts having expressions and you get to know her personality, you'll laugh more and more. Let yourself giggle. Let yourself be ridiculous, sleep-deprived and silly. You'll want to hear baby laughing more than any other sound, we promise.